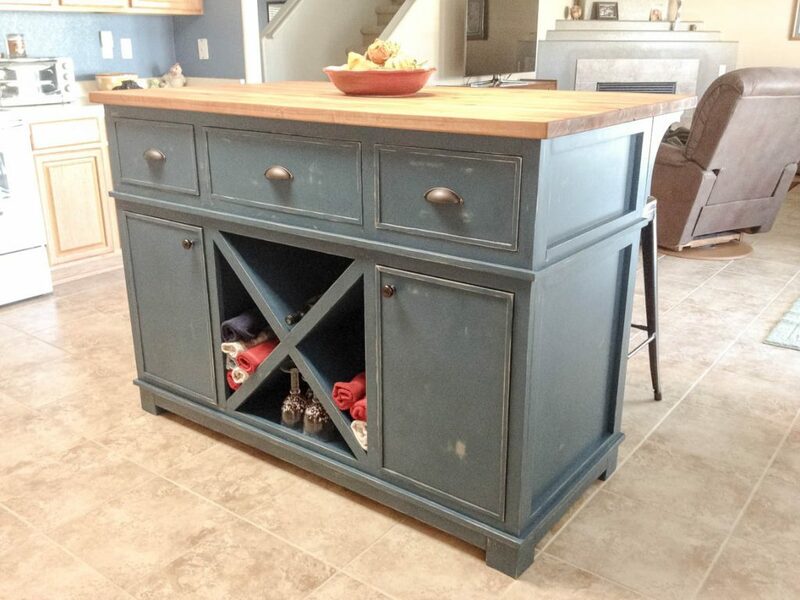 Earlier this week I shared how I built this kitchen island for my mom. 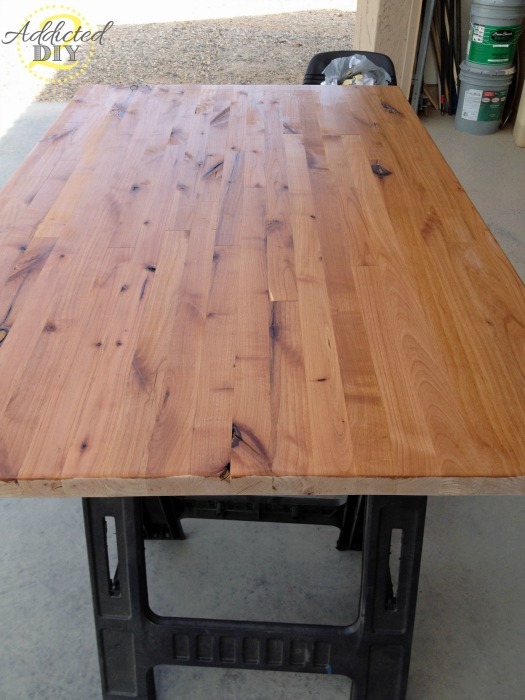 As promised, today I’m going to show you how I built the butcher block table top for it. I went back and forth, fretting over whether to build a butcher block table top or to buy one. When I say buy one, I mean my mom. She purchased all of the materials. I was the skilled “fly by the seat of my pants” labor. I searched high and low for a cheap butcher block countertop that would fit the specifications I needed, but they were crazy expensive! I thought about doing wide planks, but my husband warned me that they might warp after a while and that small planks were best. It wasn’t until I saw this tutorial on Sawdust and Embryos that it finally clicked. The most common wood in butcher blocks is maple because of its hardness. I had planned to use maple, but when I went to my local Woodworkers Source, I happened to see the knotty alder. It is a little softer than hard maple, but still a hard wood and when I discussed it with one of the employees, we both agreed it would be a fine choice for the island top. The best part is that it was half the price! I chose my boards and had another employee plane and rip the boards down into manageable sticks for me. My wood was planed at 1 3/4″ thickness and I had it ripped into 1 1/2″ sticks. When I got home, I cut all of my long sticks into smaller pieces. I had to cut out some knots (they don’t call it knotty alder for nothing), but that gave me the random patterns I was looking for. 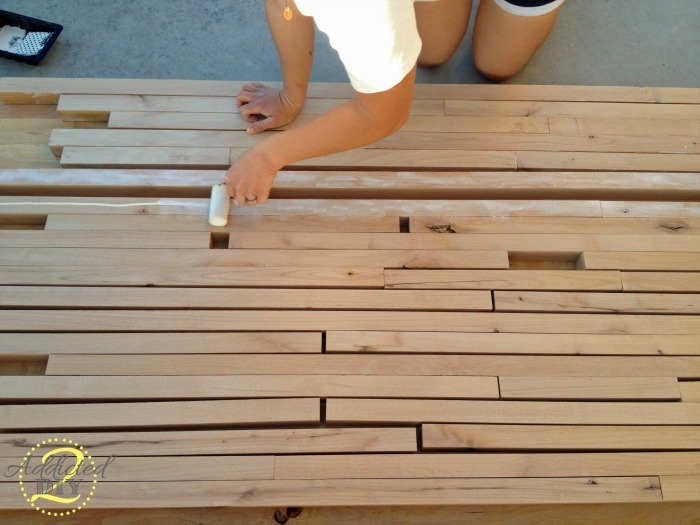 I turned the wood pieces on their sides so my slats were 1 1/2″ thick and 1 3/4″ wide. I got all of my clamps lined up and went to work. I used Titebond III to glue the pieces together. It is food safe, so a good choice for something like this. I turned the boards to the side I wanted to glue and started laying it on. I don’t know if it was the high 80s temps, but the glue formed a skin pretty fast on me, so I would work in two rows at a time and then stick them together. Squeezing a bead of glue and then using a foam roller to spread it out works really well. Be sure that if you have short pieces to glue those ends together too. When sticking the pieces of wood together, use a mallet to pound any shorter pieces into a tight joint. Then clamp tightly using clamps on the bottom as well as the top. This prevents the glued pieces from bowing, which nobody wants. I only glued half on the first night. It was getting dark and I wanted to get dinner started before my husband came back from soccer practice with the boys. On the second night, I finished putting all of my pieces together and enlisted every long clamp we had in our garage to make sure those joints were tight. You’ll have to forgive me for the bad night time pics. My time to work on things is either while my boys are in school or while they’re in bed. I let it set for 24 hours and then took it back to the wood shop and had them finish it off for me. They cut it down to size, squared up the ends, and then sanded it smooth for me. When all was said and done at the wood shop, the tabletop when from approx 1 1/2″ thick to a little over 1 1/4″ thick. When I got the table top back home, I used my orbital sander to round the edges and sand it completely smooth with 220 grit sandpaper. I used butcher block conditioner on both sides of the butcher block. This is the bottom side. You can see that the conditioner really brought out the warm hues of the alder. It turned out so much better than I had imagined it would. To be perfectly honest, I was freaking out when I was gluing it all together. I was afraid it would have a lot of gaps or that it would just fall apart on me. Truth be told, there are a couple of tiny gaps where the ends didn’t join perfectly together. The good news was that several websites I looked at said to use a mixture of beeswax and mineral oil to fill those gaps. Guess what the butcher block conditioner is made of? I just made sure to take extra care to put more of the conditioner in those little gaps. If you are looking to save a little money on your project, or if you are like me and you sometimes feel like it’s not DIY unless EVERYTHING is done yourself, I hope you will find this tutorial helpful. If you have leftover wood like I do, you can also make some cutting boards with it. I’m thinking those would be fun Christmas presents. I seriously love to hear your comments, so please let me know what you think! Also, sharing with friends, liking, pinning, and tweeting is always welcome! This post contains some affiliate links for your convenience. Please click to read my full disclosure policy. This looks amazing! I am toying with the idea of replacing some laminate counter tops in my pantry with butcher block and now I’m thinking I could DIY it! What was the cost on this? I love butcher blocks, and I agree they are really expensive. Yours looks great!! The butcher block when all was said and done came out at just under $200 for all materials/supplies as well as the milling cost of $45 to rip it down into strips and then sand the finished tabletop and cut it down to size. The cheapest I could find a maple butcher block in this size was $300 and that was buying online, but there’s no guarantee we wouldn’t have had to send it back for defects, etc. We didn’t want to risk that. Yeah, $200 for that size is a great deal. Nice job! In the future you could always look at IKEA for their butcher block under kitchen counter tops. They offer a great piece in the “birch” wood for about 195 bucks and then just cut to size, sand it and shape it! The only problem with the IKEA butcher block is it’s particle board in the middle. 9/16″ real wood. Great price though. Really?! I had no clue! I’m glad I went with my own, then. Thanks for that tip! Actually IKEA has both the particle board or the solid wood option. 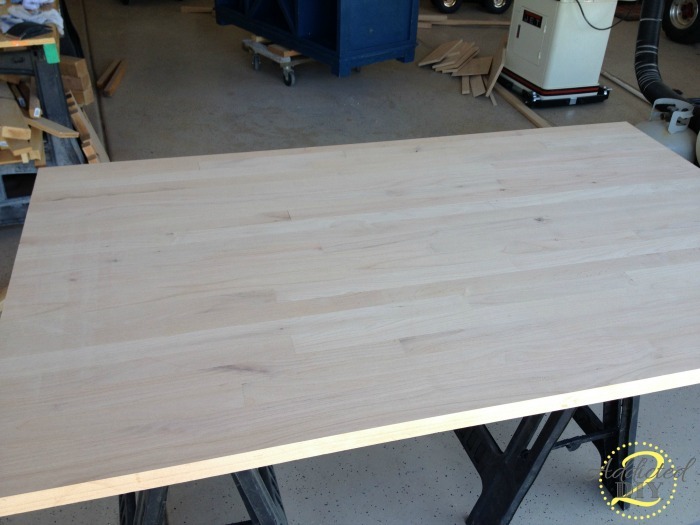 I recently bought the HAMMARP solid oak countertop from IKEA for $140, 74″ x 25 5/8″ x 1 1/8″. They only offer it in the standard depth 25″ so you wouldn’t be able to make such a big island. That looks great, I’m amazed at how good it turned out. Nice job! Well you can make it into a single countertop, but you would need to seam it just like the butcher block is made above into one wide top, and then finished however you wanted it. Totally impressed with your project! You went the best route building it yourself. With manufactured boards, they wouldn’t have used the same high quality and effort you put into yours and you would have probably ended up with a bunch of sticks over the years instead of an intact top. Thank you, Mike! Yes, it’s been nearly 3 years and it’s still going strong! What was your final dimensions? Sorry if I over looked this info if it’s already posted. Hi Abby, the final dimensions of the butcher block are 5′ x 3′. This came out so Great! Congrats! I am working on doing that same, but have a question. When you were gluing the boards two at a time did you glue them all before clamping?Or did you have to clamp and adjust as you added more. It doesn’t seem like the gluing would take too much time to have to clamp as you go, But would love some tips from someone who is more experienced with doing this. I hope it all goes well! Good luck! With all that glue, is it the type that will not affect food or cause caustic reactions on some foods? Can you please tell me the name of the glue? Can I ask why you took it back to the shop to have it sanded? Did the glue squeeze out of the seams? I assume you just need a more heavy duty sander than an orbital? I took it back to get a nice even surface on it. It was faster than using my belt sander and smoothing it all out. Something you might think about for future projects, look for free wood on craigslist or other sites. I had someone offer me a Maple tree they had cut down, I paid $90 to have it milled down to 3″ and 4″ slabs. From there you can cut it up into just about any size you want, leave it a large slab, or even have it milled down to 2″ as well. Just a few ideas thrown out. My wife has asked for a Maple Butcher Block Top island. Wow! This looks really beautiful! I can tell you worked really hard on the butcher block and it looks amazing on your custom island. Congratulations! Oh, and I’m glad I’m not the only one that works into the evening hours!! Congrats on a job well done– I’m sure your mom is so appreciative! we are in the middle of a kitchen re-do, I’m considering a butcher block for the island. I’m not sure whether to thank-you or curse you for showing this. My “i-think-can” side is telling me to go for it and make my own. Your’s looks gorgeous! Lol! I promise it truly is actually not too bad. The biggest thing is to make sure you have a wood shop nearby that can sand your glued piece for you. Otherwise you’ll be using a belt sander forever! I’m not sure if you did this or not, but one thing that may help those sanding the glue at home is after you press the wood strips together and it seeps up the cracks, take a putty knife and scrape the excess glue while it is still wet. This significantly cuts down on the hard dried glue that sits on the top to be removed later. Nice work though, it came out very nice and your instructions were well explained. Thank you, Ian, and that is a great tip! Noooooo! That is a bad idea. If you do that and don’t get every drop of the glue off it will fill he grain of the wood and won’t allow your finish to absorb into the wood making discoloration in the finish. Oh, how pretty! I love the knots, too. I’d love to have cabinets out of knotty alder. I also made my own butcher block. Mine is a 24″ piece to the left of my stove, then to the right, it’s 14′ 5″. Mine is maple, made of odd, mostly 2″ or so sticks, anywhere from 8 to 12′ long. I got them for $2 to $5 a piece at a reuse center. I made mine exactly like you did, gluing and clamping a few at a time.. I worry a tiny bit about not biscuiting or using a pocket hole join, but so far after 2 years, it’s just plain fine. I had to make mine in place, given how long it is. I would have loved to run it through my planer, but it became just too big. I don’t know why anyone with any ambition towards DIY wouldn’t make their own counter. I think it’s one of the easiest projects I’ve undertaken. And like yours, the biggest statement piece! It looks awesome. Kudos to you. Thanks for sharing. What did you use to secure the top to the cabinet? 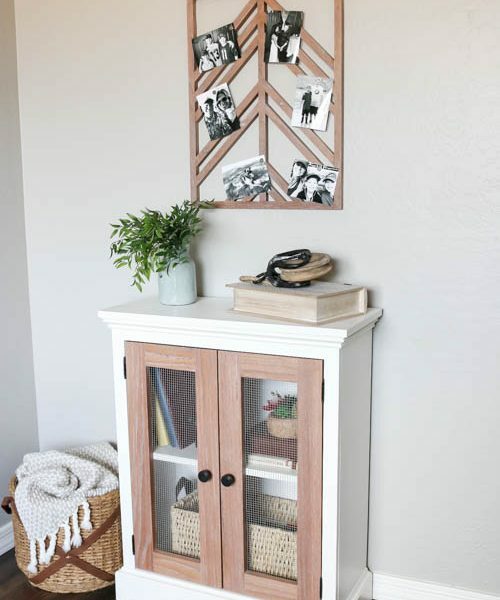 Did you glue the bottom of the top to the cabinet or did you drill, screw down and then fill in the holes? I used pocket holes to secure the top to the base. I did not fill in those holes, because they are virtually invisible being that they are at the top of the cabinet base. I am trying to DIY some butcher block now. How do you make the end pieces tight that are opposite the direction of the clamps? I think I’m understanding what you are asking, but if I am wrong, please let me know. The end joints between the wood were just tapped together with a mallet. I would loosely clamp everything and then tap each end of the butcher block to get the joints tight together, then tighten the clamps. I hope that answers your question! It looks amazing. I have one question…how do you finish the ends??? I’ve been having trouble staining and finishing the ends of my projects. I finish the ends just like the top. I rubbed the butcher block conditioner on them and then buffed it when it dried. Your project came out beautiful! 33 years of marriage and my husband has been holding out on me. I never knew he could do any of the fabulous stuff we are doing to our place that we plan to retire at. I say we only because I hand him tools and hold this or that. We are almost finished redoing our kitchen. We started 2 years ago. We redid as funds and spare time allowed. We got maple hardwood flooring for free from one of the schools that was redoing the gym floor. Which put a hold on the kitchen project. We did the living room, dinning room, and kitchen with it and my husband is planning on making the end piece of the counter top out of the left overs. After reading you tutorial I’m confident that we can do it without any difficulty. Before you start glueing, mix up a paste of glue and very dry sawdust(sanding dust from the wood (dry on a radiator) as a very fine paste, and keep handy, it should be as thick as you can make it, like wet toothpaste. When you are tightening up, tap the ends in, if any are a bit too gapy, loosen off a touch, and draw back, a dab of paste, and Bob’s your uncle. My Grandfather was a panel maker, and said, when knocking up strip tables and butchers blocks, the strips were better joined when the wood was not totally smooth plained, it gives a better bite for the glue if the wood was a bit hairy ! his blocks (always 4″ at least thick) would be made from wood kept in the boiler room, and be totally dry. He would do these jobs in the winter ; take the wood out, joint them up, band them in steel, with bolts every 18″ if it was a big block, the corners held ends together. then leave it in his cold workshop for a month. 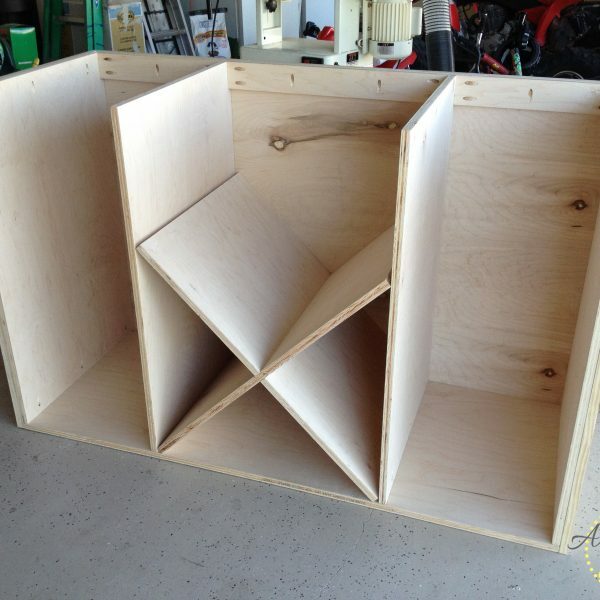 It would swell back into the banding and be tighter than he could ever do with clamps. I have seen one of them, and it has no gaps, the wood is like iron, and does not cut. The butcher’s grandson has it in his kitchen. He never mentioned it, but there was a rebate for the band, and the ends of the band just overlapped each other, with a deeper rebate, and a swan neck at that point. Thats very neat, how long did the process take? Just debating if I should do it or get knottys.ca to make it for me. The whole process actually didn’t take too long. Waiting for the glue to dry was the longest part. Ok, this is a design question as much as anything. My husband and I are remodeling our kitchen. We have a little too much counter to do with our purchased granite slab and don’t want to spend $1100 on another slab for 2 square feet. What I am thinking is having a section of butcher block counters flanking my range. Do you think DIY butcherblock will stand up to being next to the stove? Also, those two spaces are the only counters on that side of the kitchen, is that going to throw everything off? I’m trying to get a picture in my head about your kitchen design, but to answer your first question–yes. A DIY butcher block will hold up fine. When I was contemplating having my local wood shop build the butcherblock for me, they would have glued it the exact same way I did. To answer your section question; if those two sections of countertop will not be touching the granite (as in they are on their own wall and the other countertop is on the other side of the kitchen), then that won’t be a problem at all. If you have it butting direction up to the granite, it may look a little off. I hope that makes sense. If it doesn’t, please feel free to ask more questions! What size was the finished countertop? How many board feet did you need to buy? Im torn between buying something premade or getting some 8/4 oak to build my own. Im just not sure how much oak i’d actually need if the top were going to be 25” w x 48” l.
I’d have to look for the receipt to figure out the board feet, but the finished top is 3’x5′. If you could, i would really appreciate that! My top will be slightly smaller, but, at least i will have a ballpark idea of how much lumber i might need. I still haven’t found the receipt for the wood, but for some reason 56 board feet still keeps coming to mind. That number might be less if you are using maple or something else. Using knotty alder meant I had a bit more waste because there were a few larger knots. That is not butcher block (which is by definition end grain to prevent dulling knives). What you made is a (very nice) ege grain counter top. Serious wood workers cringe when they see this common misnomer. First, that island and the counter top turned out BEAUTIFULLY! We are about to start our own kitchen reno, and have discussed to great lengths the idea of building a kitchen island. I love that it has the wooden counter top. Since it looks like this was posted just over a year ago, how has the counter held up? Does your mom cut on it and use it like a normal cutting board? It has held up great! My mom doesn’t cut on hers, but only because she doesn’t want to have any scratches on it like a cutting board would. Cutting board is not butcher block. JUST CURIOUS IF AT SOME STAGE IN THE PROCESS CAN YOU CUT A HOLE FOR A SINK! I AM ABOUT TO REMOVE MY OLD SINK ISLAND THAT SEPARATES MY KITCHEN FROM MY LIVING ROOM, TO OPEN UP THE SPACE BUT DO NOT WANT TO MOVE MY PLUMBING……SO NEED A SINK IN THAT NEW TOP. Yes, you can cut a sink in with a jigsaw. I’m inspired. I need a wood counter for an island with a slide in range. Do you think that I could make the countertop in the shape I need? Or will I need to make a rectangle, then cut the opening for the stove? 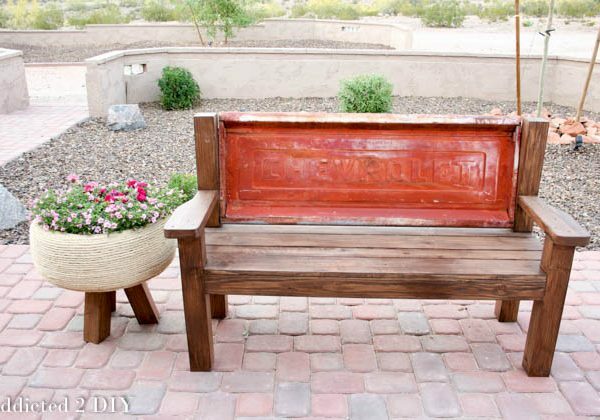 How often do you recondition the wood? Every six months to a year, depending on how often you use it. Obviously, the weather conditions where you live will also determine the amount of moisture the wood will retain as well. Wow! I love this! We’re selling our home and if I could I’d take the butcher block island with us because I love it so much. Now, I won’t have to search near and far for another one in the new home… Thanks for posting. A cabinetmaker and could not have done a better job myself. You were extremely smart taking it to a local woodworker shop to sand smith and even and to cut to size. Simply beautiful job. You should be proud. My understanding is that Titebond III is only approved by the FDA for non-direct food contact. I don’t want anyone to think (like I did before researching) that it’s safe to place their food on anything made with using it. The glue is between the boards so it’s safe. Titebon III is pretty standard for cutting boards. Are Titebond Glues safe to use? All of our Titebond wood glues are safe to use and produce no harmful fumes. They meet the requirements of ASTM D4236 for safe use with arts and crafts. Titebond III Ultimate Wood Glue and Titebond II Premium Wood Glue have both been approved for indirect food contact. For this reason, it is the glue that we recommend for making cutting boards. We do recommend wearing gloves when working with the Titebond Polyurethane Glue because repeated use of the product with bare hands could lead to a sensitivity to those types of products. this is a great project and you did a wonderful job!! the amount of ads is terrible! it makes me not want to read till the end!!! Thank you for your comment. Can you tell me how your were reading my post? Was it on your computer or a mobile device? I want to check to see if there’s a way I can make your reading experience better. Thank you. This looks great! I am considering doing ‘butcher block style’ (don’t want the wood police to mock me] counter-top. My question is, did you do anything more to seal the wood other than condition and buff? Since wood is porous, and must be able to be cleaned, I wonder if there is more to the finish than mentioned. I guess it depends on how you want to look at it. What I meant in my post is that I didn’t buy a countertop for it. I built one myself. I did need the help of the wood shop since I don’t have a 36″ drum sander, and it was certainly easier for them to do it than to spend hours trying to make everything even with a belt sander. I also didn’t have a very good table saw at the time, so it was hard for me to rip down the wood for the tabletop. I don’t believe that takes away from the DIY factor of this project, but we’re all entitled to our own opinions. How do you clean the butcher block? Can you use it prepare dough add well for baking? You can clean it by scrubbing it with soapy water. Wipe it down again and then wipe with a dry cloth to remove all of the moisture. 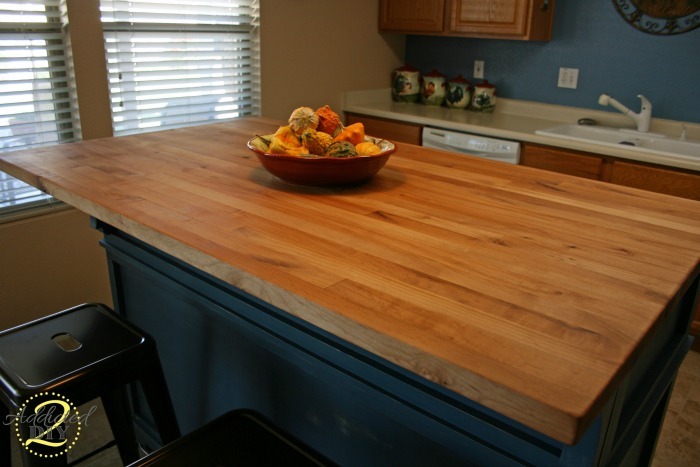 If needed, you can use butcher block conditioner or mineral oil to recondition the wood, once it is dry. You can certainly prepare dough on it for baking as long as there are no cracks or gaps in the countertop. Having a scraper will be perfect for cleaning all of the large bits of food/dough off of the counter before you clean it. The finish boards do not look like they are an inch and a quarter. Are they ?. I’d say they’re probably about 1 3/8″. Maybe I missed it but I didn’t see a size anywhere? 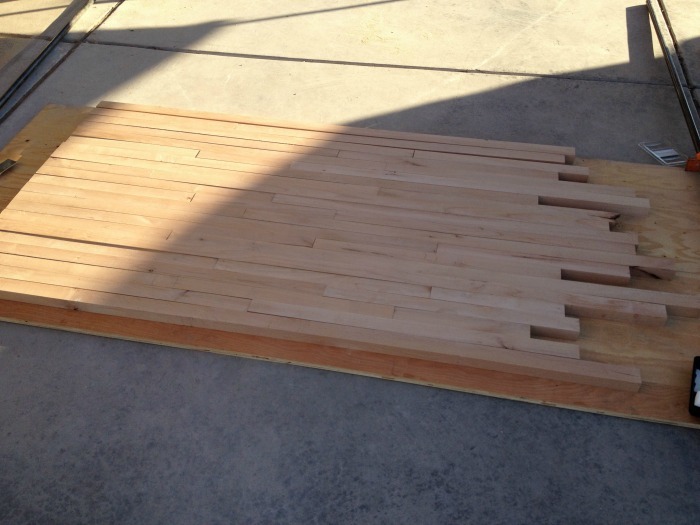 I bought a 36″x72″X1-1/2″ Birch butcher block for $130 on sale from menards. That’s a great deal! I wasn’t able to find anything like that here or online. This one is 36″ x 60″. Great tutorial. I hope to go to my favorite wood store tomorrow and pick up a bunch of shorts to make my table top. I love a variety of woods and the price per pound can’t be beat plus who doesn’t like digging around in thousands of pieces of beautiful hardwood. Since I’m making a table ill be using the polymerized tung oil finish and dealer from lee valley for a more durable finish plus I have it at home. Thanks for posting your tutorial it’s helped convince me that this is definetly doable with my skill set. I’m sure it will be beautiful! A mixture of woods is always a great way to change things up and add some interest to the finished top. Also, thank you for this post. My husband and I are moving into a new house and the current counter is hunter green tile with grout in between. It’s awful! I have wanted to change it and have also looked up prices for these counters. 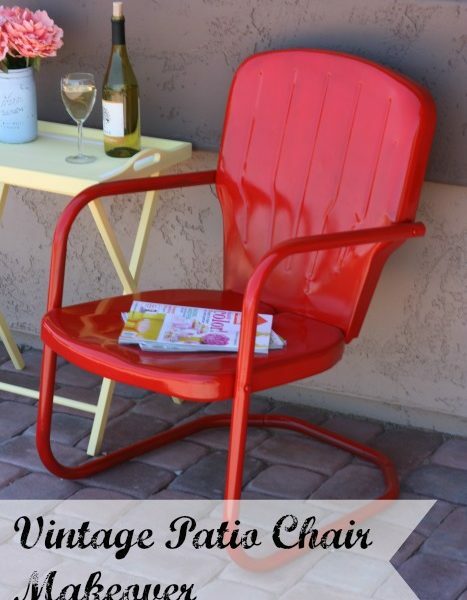 I love DIY, so I’m hoping to accomplish this task myself somewhere in the near future. I hope this one is still as gorgeous as the day you finished it! Yikes! That must be lovely! Lol! Depending on where you look, you can purchase the counters at a fairly decent price. Building this one was necessary as the dimensions of it could not be found at a reasonable price. It does still look great, too! I’ve found 24″ x 96″ butcher block counters at Floor and Decor for around $180 for maple, which is a great price! Nice job, and great information! Currently building a house, and thinking it would be fun to build my own butcher block countertops. Always liked purple heart, toying with the idea of using some 1/8″ strips at random with maple just to add a bit of color and contrast. Thanks Craig! Your idea would be gorgeous! Any tips for buying lumber and not paying an arm and a leg? I know one of my blogging friends gets tons of free cutoffs from cabinet making companies. You can research those in your area. You can also watch for sales at your local hardwood lumber store. Mine has monthly sales for different species of wood, so if one I like goes on sale, I go buy some. This is awesome! I am also in a kitchen reno and think this would be a great counter top. Seriously considering this. You’re very welcome! Best of luck in your kitchen renovation! I was wondering if you used a stain on your wood, I did not see you mention it in your blog. Are stains okay to use? My husband is making me a butcher block cabinet and I want to make sure if we use a stain it will not affect food prep. I did not stain this, but you certainly can. As long as you use a strong sealant over the stain, it should be fine. I recommend Waterlox sealant for a durable finish that can be wiped down. Just make sure you follow the instructions and purchase the correct cans. I had to learn from that mistake on another project! Great tutorial. I wanted to put Butcher Block on work bench I built but it was going to cost me $600 or more for about 6ft of Butcher Block. I wanted to know, did you put biscuits between each of the wood pieces with a planer? You know to reinforce the wood? Or is it held ONLY by Titebond glue? You can certainly use biscuits, but it has held strong for nearly 3 years with just being glued. 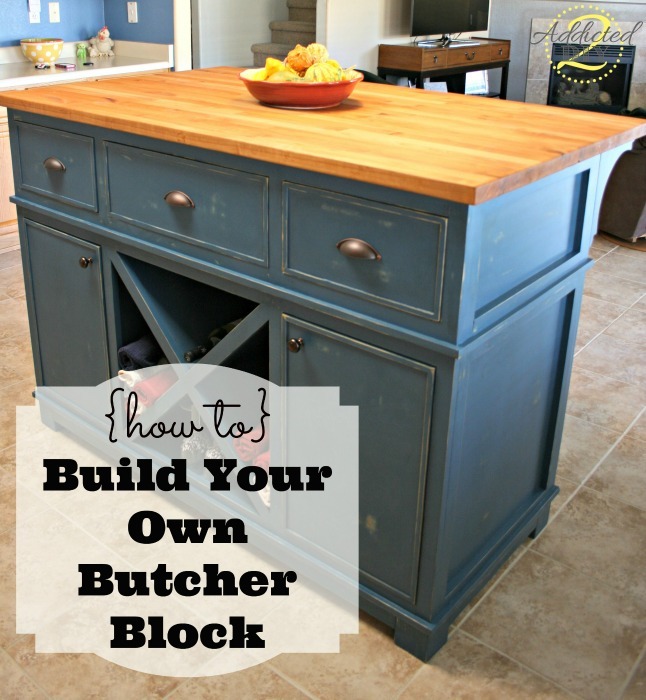 Fantastic butcher block and DIY that you have created. This is inspiring me to create one of my own. Do you have any recommendations on where to look to find a nice cabinet to rest this butcher block on? I’ve already looked at the big box home improvement stores. Thanks! Thanks so much! Unfortunately, I don’t have any suggestions, other than building your own. This is not 100% DIY since you had to outsource an easy part…cutting and sanding. Considering he is 45 and lives in his Mom’s basement, he should have all the proper tools. However, it is fairly obvious his only interaction with a female is when someone as honest, upfront, and a genuinely nice person as you, replies to an antagonistic post of his. Sorry for the rant, keep up the great work. Absolutely beautiful! You did an amazing job! 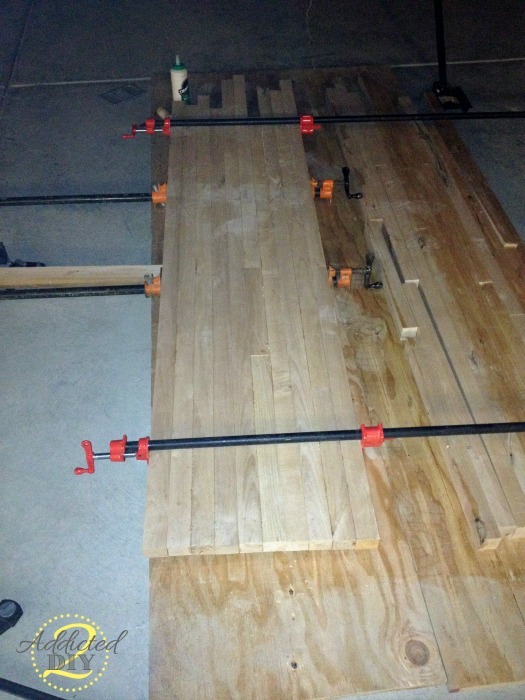 We are starting on our butcher block countertops and we aren’t sure how long (and short) our boards should be. We are thinking we don’t want to go any shorter than 24 inches. Could you tell me the approximate sizes of your shortest and longest pieces that you used? Is there more of a possibility of shorter pieces moving over time? Hey, I’m thinking of doing a maple top but with 2×6. Why did you rip down your boards? For easy handling? We ripped them down to use the edge grain of the wood, rather than the top grain. If you have absolutely no intention of cutting on them, then you’re perfectly fine using the 2×6 boards rather than edge or end grain. My table top is currently clamped. I bought shorts from my favorite wood shop in 7 different species of wood including some exotics. They charge by the pound so for 50$ I have my beautiful table top plus 5-7 cutting boards. I plan on using a hand planer for the top which I have never done and then finish it off with a belt sander. This is the first pieces I’ve made for the off grid farm house I hope to build in a year or two and a good way to gain skills for the major project. Wow! I’m super jealous of the by the pound wood you bought! Your table top sounds like it is gorgeous! Typically, do all wood shops do planing/sanding? How do I find one? I can’t speak for all wood shops, but I would think they would have the ability to do so. You can do a google search for local lumber/hardwood stores. Rockler also has many locations across the country and I believe they can also do this. My brother does Harwood floors and sometimes has spare wood laying around. It all interlocks, so is it possible to use that wood for my butcher block? It would be very thin and not have a lot of structural integrity unless you did it as an overlay on top of sturdy plywood or another material. The hard part would be finishing the sides and ends to make them look like a solid piece of wood. I am in love with this idea!!! How is it holding up now? It’s been 3 years and it’s holding up great! 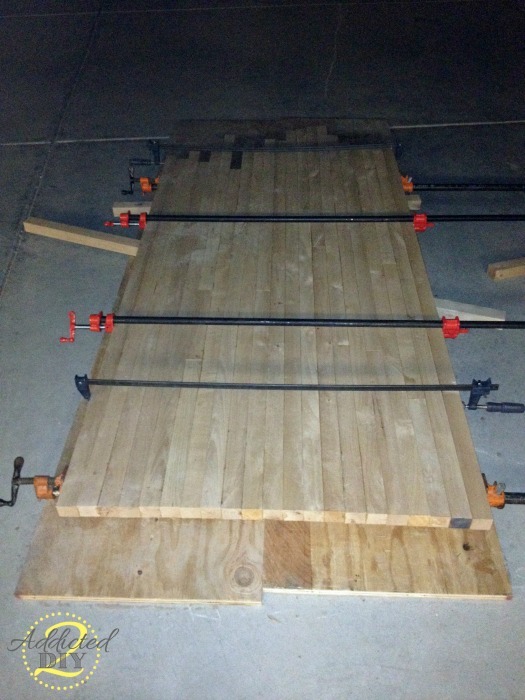 Awesome job, I want to do this myself can you send a list of what you used for wood, glue and of course how many clamps I would need for a 36″ x 36″. I know I must sound pretty lame but new to this and I want to be sure. Any estimate on how much it might cost to make a 32×86″ top the same way you describe? I wish I could give you an estimate on that, but the cost of lumber varies greatly depending on where you live and where you purchase it from. I wouldn’t even be able to hazard a guess, unfortunately. I just pulled up a board foot calculator and per your measurements, you would need about 38 board feet of material. That is based on 8/4 lumber. You can call your local hardwood store and ask them. Some also have websites where you can see the cost per board foot of lumber. I would definitely add 10% for waste. Sorry, but I have to ask, other then you glueing the boards together, what makes this a DIY? Third party ripped it, planed, cut down to size, sanded it. Rather than go into an explanation again, feel free to read my previous responses. If it makes you feel better, I did build the entire kitchen island it went on all by myself. First off I’d like to say that you did a great job on this. And you have inspired many others and myself to try this ourselves. Thank you. Second taking it to your local shop for sanding and ripping was a very smart move. It seems like some of the negative comments are from people who don’t know anything about woodworking or the costs of the kind of equipment needed to do some of the tasks. I think the whole point of DIY is to do as much of the work as you can safely do by yourself. No shame in asking for or seeking help when needed. Keep up the good work. Very cool! Just out of curiousoty, what was the bill after materials and final finishing? That’s a great question. It’s been 4 years, so it is difficult to remember. I know that the entire island was approximately $600 for materials, paint, hardware, etc. After 4 years, how is the table holding up in both structure (warping, splitting, etc,) and finish (look, cleanliness, feel, etc.). Lastly, if you would do it all over again would you change anything in the process or material? Looks really great. My question is, my wife wants a 48×48 island, but there will be about a 10-12 inch overhang for cabinet stools for eating. Do you see any issues on the side where the glued pieces would overhang? I added corbels to this one to offer more support for people leaning. If you have that much of an overhang, it couldn’t hurt to add a little extra support with simple corbels. The ones I used are $10 from Home Depot. After applying the butcher block conditioner on the bottom, did you wait for it to dry, then flipped the block over on the sawhorse and apply the conditioner to the top? You can; however, with it being on the bottom, it’s not 100% necessary. Hard maple is even better! You can absolutely use it instead. U did such s beautiful job on this project for ur mom she must be so proud. I wish I could do the same however I am disabled and have 2 bad vertebraes and 2 lousy knees. But ur correct this stuff is expensive. I have looked in Lowe’s, home depot, Craigslist, lumber liquidators and everything is just so dam expensive. You only used butcher block conditioner or did you have to stain it? Hi Joann, I only used the butcher block conditioner. Your project turned out nice but a butcher’s block is made from end pieces. Thanks Katie. Article was very informative. I just attempted my first top. Wish I had found your article before. Gap filling technique would have been useful as I had no access to a planer/sander. All strips were done strictly using a table saw. But, turned out better than expected. Can’t wait to try again. Learned from my mistakes. Glad to hear it turned out well, all things considering. I was wondering how many knotty alder did you use for your table. I’m trying to make a 70×36 (6ftd3ft) desk. It’s been a few years, so it’s hard to remember how much I used. You can get a rough idea by using a board foot calculator. If you use knotty alder, you’ll want to add an additional 10% or so to your calculations to compensate for pieces that may not be useable due to the knots. one of the better looking butcher block i have seen. I’ve seen you made it last year how is it holding up ? Fantastic job! You mentioned that you wished you had done a more permanent seal. What would you suggest? (BTW, the link you shared earlier in comments doesn’t take you to what it says it will). I’m truly wanting to do this, but I need to get my hands on long clamps. I wonder if those are easily rented? I would say a sealant like Rubio Monocoat would be perfect for this. It maintains the seal for a long period of time. That or a polyurethane finish. I love that you did this from scratch and shared the details. Most of the other projects I’ve seen tell you how to build the base and then have you go buy the top. I want to build a large island with a sink and dishwasher built under and the cost of the top would be prohibitive. Thank you for sharing your experience. Happy to be of assistance! What you said is exactly why I decided to build the top for this. It would have been far too expensive to purchase a wooden counter top at this size. Not to mention the fact that it would have to have been custom made to fit these dimensions I needed.